Lyle Tuttle, the forefather of modern day electric tattooing visits Lucky Rabbit Tattoos! We have had the ultimate pleasure in welcoming Lyle Tuttle to our studio during business hours yesterday. To those of you who don’t know, Lyle has been tattooing since 1949, has been on the cover of Rolling Stone, was featured in the Wall Street Journal, and numerous (too many to count) industry based magazines, as well as TV appearances since 1971. He has tattooed such people as Janis Joplin, Peter Fonda, Cher, Joan Biaz, as well as the Allman Brothers and all of their roadies. . 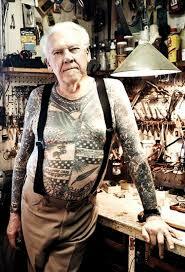 He is considered to be a Forefather of Modern Day Tattooing. When published for the cover of Rolling Stone in October 1970, Sailor Jerry put his picture in his toilet. He now operates Lyle Tuttle’s Tattoo Museum in San Francisco which boasts the largest tattoo memorabilia collection in the world, and as also part owner of www.tattoos.com We are glad to have been able to have the honor of being added to Lyle’s personal collection, of tattoo shop pictures and business cards. Thanks for the Visit Lyle, it was an honor. And I will see you next week for the St. Louis Tattoo Expo!